Rick Griffin is a Southerner with a thirst for adventure, while Sandi McKenna is a Northerner who leans towards leisure. 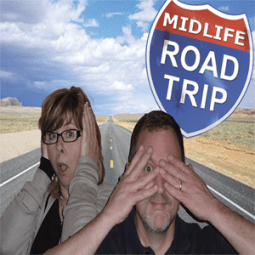 As a result they return from almost every Midlife Road Trip journeys with wildly differing opinions about what must be experienced. Flying to French Polynesia for an island hopping adventure aboard Windstar Cruises’ luxury yacht, the Wind Spirit, was a bucket list adventure of a lifetime. Here’s a his way/her way look at how Rick and Sandi recommend you experience this tropical paradise in the South Pacific! If you’re fascinated by sea life, I highly recommend taking Moorea Snorkel Safari excursion. The day of my adventure it was pouring down rain. But I didn’t let that dampen my spirits. Heck, I was going to be wet anyway. Our guides assured us that the particular breed of sharks in the area were not known to attack humans. Still I was a little nervous when I first got in the water. I may have even wet my wet suit just a little when the first shark swam by. Within minutes the waters were teaming with more sharks and rays than I could count. Talk about an adrenaline rush! In spite of the rain, the water was remarkably clear and I was able to capture some awesome under water photos and video. The excursion is a great opportunity to encounter a kaleidoscope of tropical fish and stingrays and to check swimming with sharks off your bucket list! Since the islands are famous for black pearls, I recommend visiting the Anapa Pearl Farm in Raiatea. The farm is a small off-shore bungalow that sits above a coral garden and is accessible via a motorized inflatable raft. Upon arrival, visitors are greeted with fresh coconut, mangos, and grapefruit to snack on while learning how the farm cultivates, harvests, and grades pearls. After the presentation you get to go snorkeling around the coral garden and dive down to retrieve your own oyster! An expert grafter then extracts and grades your pearl. You return home with a most unforgettable souvenir. Other pearls and jewelry are available for purchase in the farm’s boutique gift shop. Viewfinder Tip: If you’re going on a cruise, arrive a day or two before departure as you’ll need to recover from the long flight. To get a great feel for the beauty, history, and culture of Bora Bora, I recommend taking a 4-wheel drive tour of the island. The journey includes an ascent up Pahonu Hill, exploring a site with World War II cannons, visiting a mountain plantation, traveling through the lush tropical valley of Faanui, and a stop at the island’s famous restaurant and bar, Bloody Mary’s. The ride and be quite rough at times but the spectacular views are totally worth it! One of our best travel tips is to eat like the locals and that is especially true in French Polynesia. Living on tropical islands, the locals are blessed with an abundance of seafood and they know how to serve it up! The islands by far represented the best overall seafood experience I’ve ever had in all of my travels. During the seven days of my trip, I probably consumed more grilled fish, lobster, sushi, and sashimi than I typically do in a whole year. For breakfast I often had a famous dish called “raw fish with coconut milk.” The tasty dish consisted of raw white tuna marinated in coconut milk with cucumbers, lemon juice, cucumber, tomato, and garlic. It may not sound appealing, but give it a try. You can thank me later! Since it was a 5-hour flight from the east coast to Los Angeles, and another 8-hour flight from L.A. to Faa’a International Airport in Papeete, Tahiti, I decided to leave a couple days early, allowing plenty of time to get a good night sleep at the Le Méridien Tahiti as well as have time to explore Papeete, the capital of French Polynesia. First stop: the Marché de Papeete, a very large market that sells local produce, fish, and handmade crafts and jewelry. It was here that I was introduced to Tahitian monoi oil, which is made from soaking the petals of Tahitian gardenias or Tiaré flowers in coconut oil. Shopping aside, this trip was all about soaking in the island vibe and basking in sun. The beaches are magnificent. My focus was rest and relaxation, and several excursions to private motus made me feel like a youthful Maryanne on Gilligan’s Island. No crowds, no souvenir shops, no billboards or buses—simply sand, surf, and sun. We boarded an open-air bus in Bora Bora for a guided tour of the island. This wasn’t one of those stuffy, air-conditioned tour buses but more of a local jitney with cushioned bucket seats and adorned with fresh hibiscus flowers. As the bus rolled along the coast with breathtaking views as our backdrop, our guide regaled us with Tahitian history and local anecdotes. We stopped to learn how to make and wear pareos, colorfully dyed and individually designed sarongs or wraparound skirts. These also made for inexpensive and easy to pack authentic gifts to bring home. Taking an outrigger canoe to a private motu was an absolute highlight of this trip to French Polynesia. We dropped anchor in a small inlet, for some snorkeling before continuing on to the motu. We arrived at the motu and learned to make Poisson Cru, Tahitian Raw Fish made with fresh coconut milk and lime, learned about local traditions, and then swam in the clear blue water. The cool tropical breeze and the warmth of the sun, along with the beautiful scenery made me feel as though I didn’t have a care in the world. Mission accomplished! Island hopping is definitely the way go, with one island more beautiful than the next. The locals are warm and welcoming. And, sunsets are spectacular. Just a stone’s throw from the Le Meridien Tahiti is an unassuming strip plaza where I stumbled upon Le Fournil Hautbois, a French bakery that has both sweet and savory offerings at very reasonable prices which made for a delicious and inexpensive beach picnic. The staff is very friendly and helpful. Everything is baked in-house from scratch with local ingredients. From flaky croissants to a sandwich on crusty bread, this authentic French bakery is worth a visit. In fact, I made several. What’s on your French Polynesian bucket list?